Sometimes, due to iPhone crashes, iOS updates, jailbreak failure, accidental deletion or some other reasons, some iPhone users may lost their important data. By the nature an iPhone is always in danger of getting damaged, lost or stolen. How about your important iOS data?how to recover lost data or deleted files from iphone? As known to all, If you have made a backup in advance, you can recover lost data by restoring iPhone with iTunes or iCloud backup. But this is limited to that you have made backup before losing data from iPhone and this backup contains these data. What if you haven't any backup? Normally, you have to face the fact that your data are gone and never back again. But nothing is impossible. This post will show you how to recover lost data/recover deleted files from iphone with Bitwar iPhone Data Recovery. Bitwar iPhone Data Recovery is a professional data recovery software for iOS device It has friendly user experience and wizard operation, you can recover the data by only three steps and easily find the lost data even if you are not familiar with computer operations. It can recover the lost data of iPhone/iPad/iPod touch, including Messages, Call logs, Contacts, Bookmarks, Reminders, Notes, Calendar, Photos, Voice memos, Videos, etc. And allows you to preview deleted files in thumbnails before restoring them, so you can selectively recover what you need. Next, take the Contacts as an example to describes how to recover lost data on a iPhone . To make sure that you can retrieve the deleted files, there are two things to do:Stop creating new data and Recover the deleted files with Bitwar iphone Data Recovery as soon as possible. 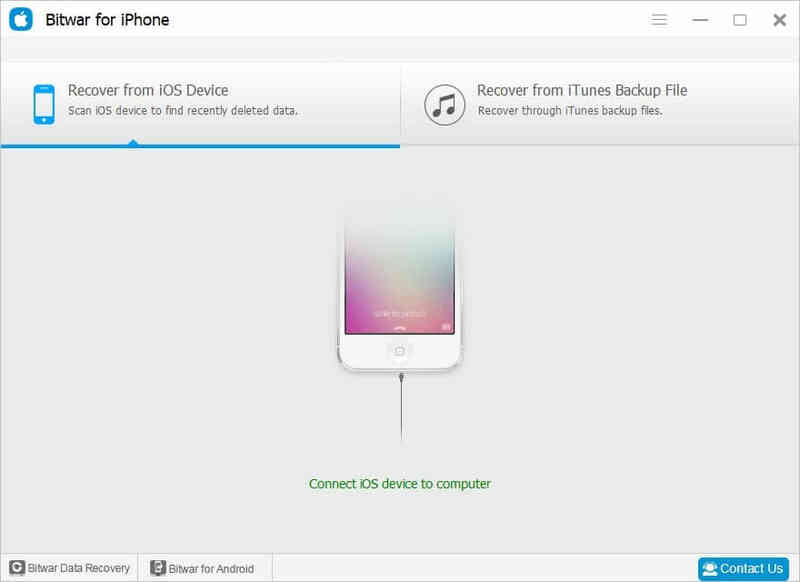 When both itunes and Bitwar iphone data recovery are installed, start the Bitwar iphone data recovery program and connect iPhone/iPad/iPod to the computer with a USB cable. Select the default recover mode "Recover from ios Devive". After you start the scan, the program will automatically scan your iPhone/iPad/iPod touch to search for deleted files or lost data. During the scan, if you see the data you are looking for, you can “pause” or “stop” to start previewing and recovery. When the scan is finished, the program will show all the scanned data. You can click on contants in the list on the left to preview all deleted information. Finally, you can click "Recover" button to get the selected files back. According to the above operation the Contants has been successfully recovered. – No matter whether you have made backup in advance, you can apply this tutorial to recover deleted files from iPhone/iPad/iPod touch. – This method also can be applied to recover Messages, Call logs, Bookmarks, Reminders, Notes, Calendar, Photos, Videos, etc on iOS Device. Next：How to recover lost data from iPhone after factory reset?